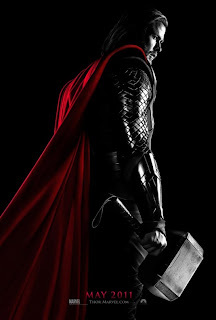 The Billionty-Oneth Geek: THOR or BORE??! And as it’s becoming typical, another Marvel movie has opened up the summer movie season. Yes, Thor, the movie about our favourite God of Thunder. But will it be up there with the likes of Iron Man, or lower like the second Iron Man, or worst, X-Men Origins: Wolverine? The movie starts off with a brief history lesson on Asgard, and its relationship to Earth and the rival kingdom, Jotunheim inhabited by creatures called the Frost Giants. The Asgardian King Odin, defeated the Frost Giants, and established a peace with the warring kingdoms. The story then refocuses on two brothers, Thor and Loki, the sons of Odin. One of the brothers is destined to become the new king, and as such, they are destined on a path of rivalry. After an attempt on their kingdom, Thor, both rash and impulsive, gathers his friends to make an attack on the Frost Giants. Nearly suffering defeat, the team is saved by Odin, who in anger, banishes Thor to Earth, sans all the cool powers. He lands in the deserts of New Mexico, and it’s here, where he meets scientist, Jane Foster, her sidekick, Darcy, and mentor, Dr. Selvig. It’s on Earth where Thor needs to become worthy again to regain his powers and wield the magical hammer of Mjolnir. But time is ticking as on Asgard, a sinister plan is unfolding by a likely traitor. The movie has its share of problems, but I would say, overall, I enjoyed the movie. But it’s a marginal type of enjoy, and I’d say it’s a thumbs up at a 10 degree angle. There were problems I had with the movie, and it mainly had to do with the story. Firstly, I think that this movie would have been better served as a sequel. The first movie should have been about Thor and his Thor-friends going on adventures, slaying beasts and saving kingdoms. You could tell throughout the movie that Thor and his Thor-friends cared for each other; it would have been exciting to see how they got to where they are at, how that trust and camaraderie was built. It’s actually these moments, when all the friends are together, that I enjoyed the most, and I wish the movie had more scenes of them working together. I’ve heard many a-complaints about it, and I’m only tacking on, but the whole romance story was pointless. From a marketing standpoint, I can understand why they had this little story line, but it was not necessary. At no time did I feel like, wow, these two are really into each other. I mean why is it that Thor became so attached to this Jane character? There was no motivation to! What, because she listened to his story about the different realms and galaxies? Bogus! The performances were pretty great all around, particularly, that of Tom Hiddleston, who played the evil Loki. He is a pretty darn good actor, and great at playing a hate-able character. I mean, just by his demeanour, you could tell he’s not one to be trusted. Chris Hemsworth as Thor also did well. I’m not too familiar with his body of work, but I know he did have the small role as playing Captain Kirk’s dad in that opening scene of the Star Trek reboot. The settings and effects were fantastic. When I first saw the trailers, I thought that Asgard and its inhabitants looked ridiculous, but it really worked in the movie. Asgard was a grand place. However, this is both good and bad, and I think this contributed to that disjointed feeling with the movie. I found that every time the story shifted back to New Mexico, it took away some of that grandiose feeling. It goes from grand magical kingdom to an American desert town. Boring. Every time they went back to the desert, I wanted to see more Asgard. The movie does build up to the Avengers movie next year, and as far as I can tell, there were three connections made, but all seemed quite lacklustre. Firstly was the unannounced Avenger cameo. Unless you knew what was going on and who he was, it was just a random addition. And he didn’t do anything cool. It was a failed attempt where much potential could have been had. Secondly, was the deal Thor struck to help SHIELD in future crises. Basically, his future involvement with the team is on the basis that they would return Jane Fosters equipment. That’s it. That’s why he’s going to be an Avenger. Stupid. Lastly, was the post-credit scene, which I guess sets up one of the key plots in the movie. Without spoiling it, it was an “oh” moment, but it didn’t “WOW” you. Is the movie worth seeing? I’d say it’s good for a rent, but it’s nothing to rush out to see at the theaters. Even worse, the 3D adds nothing to the movie, much like Green Hornet. 2D and on TV is the way to go. So back to the original question. In the lexicon of Marvel movies, I think this is definitely below Iron Man the first, but above Iron Man the second and Wolverine. Til next time, later geeks!